Raclette is mainly determined as a winter dish, a delicacy to share with friends during a skiing vacation in a small mountain restaurant. In the past, however, the fire of the fireplace, the heat of which melted the cheese, was used and it was served spread over potatoes. Raclette originates from the Swiss shepherds who cut cheese and served it towards the open fire to try it, melted over whole potatoes roasted in the embers. It was only in the 19th century that the word “raclette” appeared, from the French racler – “scrape” to give the name of the dish, which was prepared by scraping the so called until then “roasted cheese“. It is mandatory to serve Raclette with potatoes! The small, fresh potatoes are preferred; they are boiled or steamed beforehand. During the meal they are is kept warm, the standard weight per serving ranging from 150 to 200 g. An obligatory element of the supplements to the raclette is the assortment of marinades: small and large gherkins, small onions in vinegar, onion jam, olives, capers, etc. The other supplements used in raclette are according to the individual preferences of each person – a variety of meat, seafood and vegetables that are placed anywhere on the table so that everyone can combine them to their taste. Raw meats should be very thinly sliced so that they can be cooked for a short time. Suitable meats are cooked ham, prosciutto, bacon, chicken fillet, beef meatballs, duck fillet, salami, chorizo and other dried sausages, large whole shrimps, smoked fish, calamari rings, quail eggs (broken directly into the pan or on the cooking plate ) and raw vegetables – mushrooms, multicolored peppers, broccoli, cauliflower, zucchini. Finally comes the green salad, seasoned with mustard dressing and some nice peasant bread. And if in Switzerland raclette is used professionally in all restaurants in the form of an oven placed on a separate table or near the fire, French restaurants often install the raclette oven directly on the guests’ table. 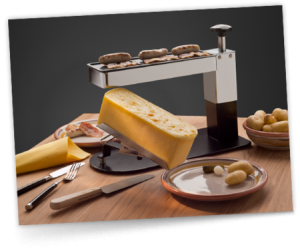 Modern practices include mixing cheese with cold cuts and introducing a specific kitchen appliance – the electric raclette, which in Switzerland is also called “raclonette“. It is placed in the middle of the table and consists of an electric grill and a hot plate above it. Various cur colds, boiled or steamed vegetables and potatoes, are added to the sliced Raclette cheese. First, the food products are baked on top of the plate, and then each person makes their own combination of ingredients which they distribute in the special small dishes (like small pans) and put a slice of cheese on top. The pan is then placed under the grill until the cheese melts. Another possible option is to melt the cheese in the pan while the other ingredients are baked on the plate and separately in the plate to pour over the melted cheese. The appliance for preparation of raclette or the so-called raclette ovens were invented in the 1960s. This applies to electrical appliances. Previously, the “raclette” was made on a burning fire, pointing the cut part of the cake to the flames. As soon as the cheese began to melt, the top layer of the cake was scraped with a knife. 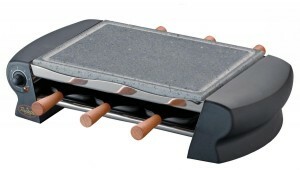 Today the commercial network offers a wide variety of raclette ovens. The models designed to melt fine slices of cheese, placed in special small pans ( the so-called “raclonette”), differs from the appliances in which half or a quarter of the cheese cake is placed. “Raclonnettes” are mainly powered with electricity, but also with a pellet burner, candle-warming or when it comes to large industrial appliances – and with gas. Classic raclette ovens – those, where the cheese cakes cut into halves and quarters are put, are powered by both electricity and gas. And although a wide variety of raclette ovens are available for sale, the authentic way to prepare a raclette with live fire is always held in respect. It enjoys great popularity especially in the Swiss canton of Valais. The most important ingredient for the preparation of a nice raclette is the cheese of the same name – Raclette. This wonderful cheese comes from Switzerland and, in particular, from the Swiss canton of Valais from the Middle Ages. Today, however, some French regions have also found the secret of cheese and it is also produced in Savoy, Franche-Comte and Brittany, as well as across Europe – in Quebec and Australia. Raclette is uncooked, pressed cheese made from cow’s milk. In 2003, in Switzerland, the “Raclette of Valais” cheese gets the so-called “Protected designation of origin”, which limits its production only in the canton of Valais with certain precise specifications for its production and a trademark for the designations Raclette du Valais and Raclette. As a result of an action brought before the federal tribunal of various cheese producers from other cantons who produced a significant amount of Raclette, the protection of the term “Reclette” was abolished in 2007 with the motif that “raclette” means culinary technique and not cheese. The time for optimal consumption of this cheese lasts from November to February after a ripening period of 3 to 6 months. As a standard, one Raclette cheese cake weighs around 6 kg. The Raclette cheese produced in the Svoya region is characterized by the fact that its maturing lasts for 4 to 5 months. Moreover, it may contain other ingredients such as cumin, black pepper and spices. The cheese is warmed under the heat source in such a way that the surface of the cheese on the cut side reaches the desired consistency – whether slightly melted for the small and delicious raclettes or well toasted for the large raclettes, emitting a pleasant smell of grilled cheese. The cake is then pulled out of the appliance, the cheese holder is moved and the melted part of the cheese is scraped directly into the plate using a special raclette knife. After the preparation of several raclettes from the same cheese cake, a crust begins to form on both sides of the cheese. It is advisable to cut it with the notched side of the knife and serve it along with the raclette. This crust is so delicious and caressing the palate that it has received the name “divine” (in French “réligieuse”). It is important to know that the raclette is a dish that is consumed as hot as possible. Typical of this dish is that guests do not wait to start feeding together, but on the contrary, everyone should start as soon as they receive their portion without considering whether the others are served or not. For a meal with Raclette, the recommended amount of cheese is about 200 g per person. It is believed that this quantity is enough for everyone to eat until one is full, even if some eat more cheese and others eat less. Half a Raclette cheese cake is usually enough to feed a group of about 6 people. If the company has fewer than 6 people and cheese remains, then it should be known that it can be preserved. The packed rests from the meal can be stored in the refrigerator for 2 to 3 weeks. And if the remaining piece is over 1 kg, it can be preserved for up to 8 weeks. So one and the same piece of cheese can be used for several meals. A traditional drink, which fantastically complements the tasting of the raclette, is the Fendant white wine. Scrape the crust of the cheese with a knife to remove the label and the top layer of the crust. But, attention, do not remove the crust, it adds an incredible flavor to the raclette. With a special cheese knife (with a cord), cut small slices with thickness of about 5 mm and width of 5 cm. Put the slices of cheese on a plate. Arrange the cold cuts in a plate decorating with the gherkins and small onions. Wash the potatoes under running water by scraping them with the hard side of a sponge to clean them in case they are really dirty. Cook for 20 minutes in a pressure cooker, then, without worrying that they are still hot, put them in a plate on the preheated raclette oven. During lunch/dinner each guest puts a piece of cheese in the small pan and puts it to melt. When it is ready, the cheese is poured over a potato (peeled or unpeeled according to preference) and consumed with the cut colds, pickles and small onions. It is served with a green salad!